Murphy’s Law says that when we went live with our Scrivener blog series, the folks over at Literature and Latte would release 3.0. And they did! But we’re ga-ga over the changes, so we’re not complaining too much. Today we’d like to share a few changes that we’ve noticed (and we’re sure we’ll find more) formatting with Scrivener 3.0. As with most things, change is change, but we think it’s for the better (mostly). 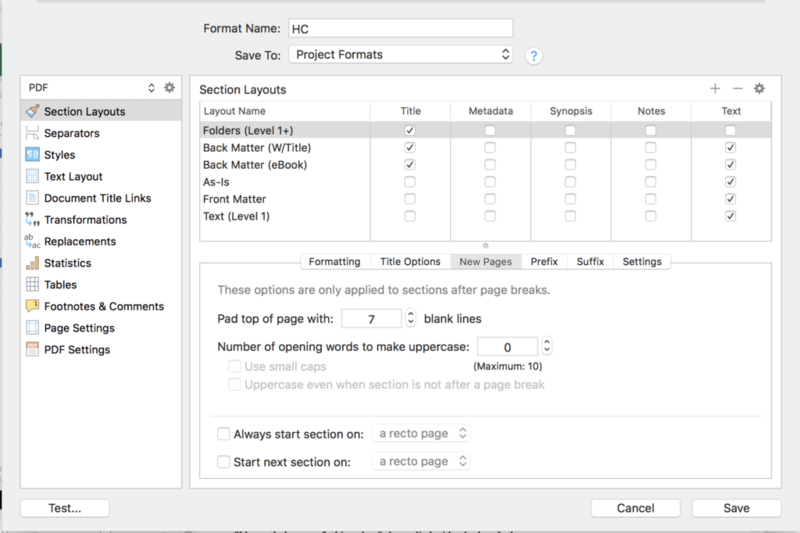 We loved that we could change front matter in Scrivener 2.0 with a dropdown menu, but didn’t like that we had to select and unselect back matter. Happily, Scrivener has fixed that problem for us. As you’ll see at the bottom of the right-most pane, you can add front matter from a drop-down menu, and also add back matter. 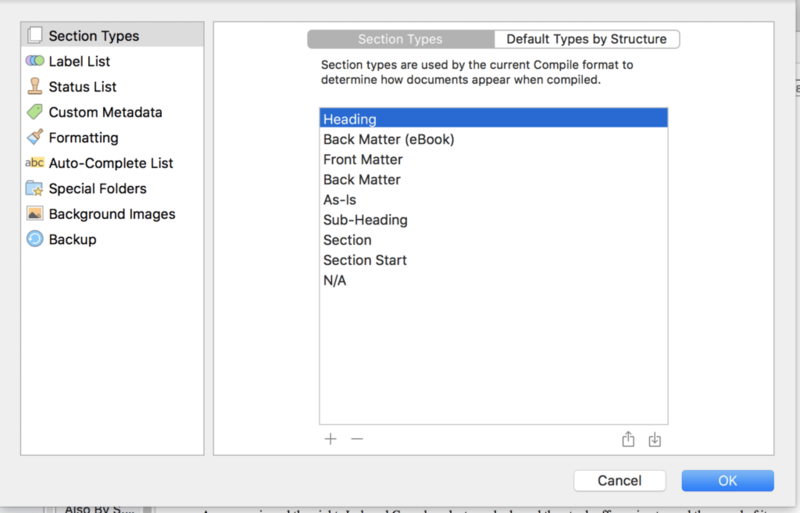 Since we usually have multiple books in a single Scrivener file, we name the folders with the book name and format, just to make sure we’re using the right one. (Note: Our Kindle files and Smashwords files use two different front matters, but the same back matter). 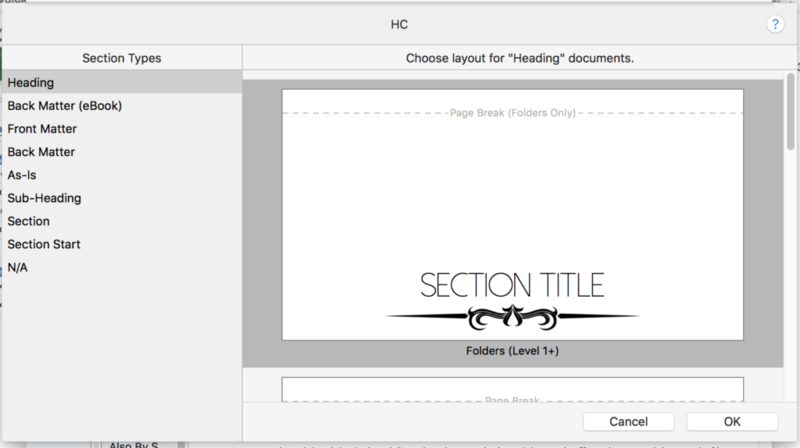 One of the biggest complaints about Scrivener 2.0 was the lack of customization on scenes at the same level. So if you had two scenes with two different fonts, you had to manually adjust them. This was particularly bothersome in front and back matter. 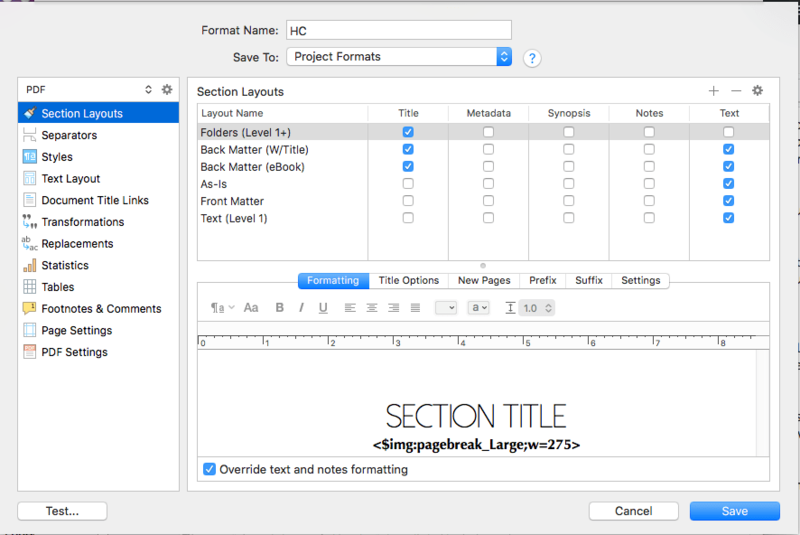 But now, Scrivener allows users to create project formats and specify different scene types per project. One thing to note is you have to create Section Types before you can assign them layouts (see our tutorial below). To add a new section type, navigate to Project -> Project Settings, then add new section types. Please note, these are simply labels; you’ll have to set the layouts via the tutorial below. 2 Here is where you’ll find most of the formatting options that previously were under the main compile screen. 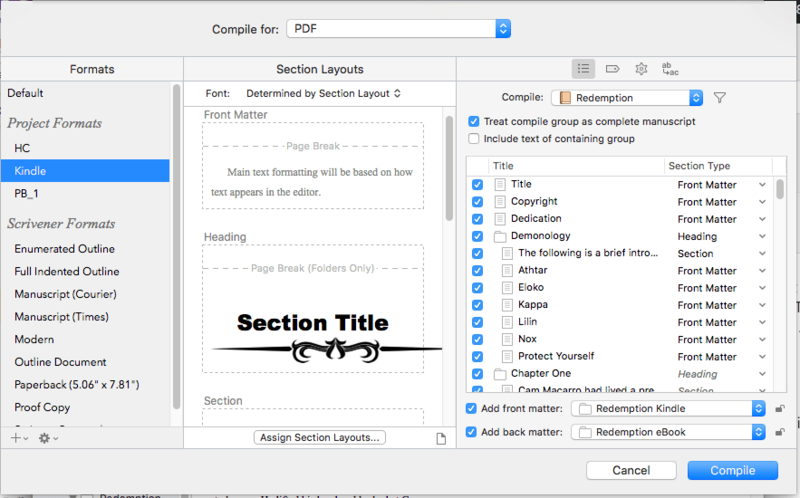 Within the Section Layouts pane, you’ll have Folders and Text, but you can add your own layouts here. We suggest having a chapter (folder) setting, a setting for back matter (eBook and print), one for as-is, one for front matter, and one for your actual book text. Depending on the type of book you have, you may add additional layouts. 3 In the Formatting pane of the Section Layout, you can see how your text will look in the book. Here you can set the font for the title and/or text. 4 To add an image above or below the folder title (or to add Chapter and autonumber), click on the Title Options pane. 5 To set the number of lines above the title page, click on the New Pages pane (still in Section Layout). You can also set your chapter to begin on a recto (right) or a verso (left) page. 6 You can also select different formats within the project pre-set, such as .Mobi, .ePub, .doc, and .PDF. Changing a style on a different format will not change on others. (Which is a good thing). Find this menu on the left side of the screen, at the top above Section Layouts. 7 Once you’ve created your styles, you then need to assign them to the specific Section Types. Click on the button called “Assign Section Types” in the central pane. 8 Here’s where it gets a little confusing. You have to create section types (the categorization of the scenes themselves) AND section layouts (how a scene is formatted). Then you have to assign the layout to the type. In other words, you have to assign your Folders formatting to your Folders type. Select the Section Type on the left pane, then locate the correct formatting on the right pane. 9 Make sure your scenes have the right section type assigned, then press compile! Also, if you aren’t ready to compile, but want to save your settings, hold down the Option key to save settings. One other neat new feature: Scrivener now opens your compiled file after it’s created.